From $3900 / person | Comprehensive package including accommodation for all nights, in-country by train, instructional materials and tools, all activities as listed on the itinerary. *International airfare and visa fees are not included. Welcome to Kyoto, where you will find your home located in the center of Kyoto. From here, famou sites such as the Fushimi Inari Jinja Shrine, the Kiyomizu Temple , and Nijo Castle are only minutes away. Your hotel is located nearby the professional kitchen that you will cook in during your stay. Led by an expert chef, you will be exposed to numerous different culinary and cultural highlights over the course of your week stay. After you settle into your hotel, you will have the opportunity to set out and explore Kyoto before settling down at a delicious restaurant for a traditional Kabbo multi-course meal. Kabbo-style dining is very popular in Japan and consists of sitting at a counter in front of the chef, as you dine on select dishes that he prepares for you. 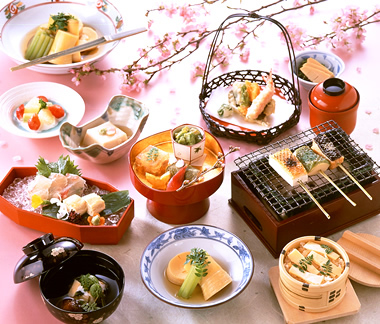 After a delicious buffet breakfast, you will begin your first cooking class of the tour, traditional Japanese bento. The lesson will begin with master chefs explaining Japanese-style seasoning and offering a demonstration on various Japanese cooking techniques. You will create several bento specialties during this hands-on cooking class as we will explore the delicate flavors of bento. You will assemble fresh Gomaee sesame salad, flavorful teriyaki chicken, delicious tempura, among other popular bento items. At the end of the lesson, you will have the opportunity to sit down with your chef and colleagues to dine on what you have prepared. After enjoying a traditional Japanese breakfast at your hotel, you will be met by your guide who will take you on a full day tour of a local sake brewery, the famous Fushimi Inari, and a local dashi shop for a hands-on workshop. Before tasting a variety of sake brews, we will visit a sake-dedicated museum to learn about its rich history. 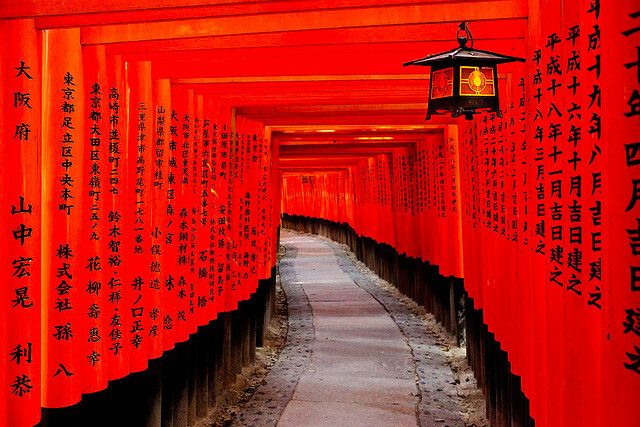 After an incredible visit to the sake brewery, we will visit the historic Fushimi Inari, the head shrine of the Japanese God Inari. Following an educational visit to Fushimi Inari we will visit a local dashi shop to learn from a master the art of making dashi. Master the intricate flavors that form the base for many Japanese culinary dishes. Soba noodles are more than just another cuisine in Japan, they are a cultural heritage. Traditionally soba is served in a variety of settings - everywhere from local eateries to exclusive and specialty shops. We will apply the dashi skills we learned earlier in the week to form the perfect soba broth as well as refining the timing of creating this culinary delight. During your afternoon free time, witness one of Japan’s most incredible sights, the stunning Cherry Blossom. This rare occurrence only occurs during the Cherry Blossom Season (March–April), and today you will have some free time to see and photograph the beautiful blossoms. After a delicious Japanese breakfast at your hotel, you will be met by your guide and set out to visit the Uji Tea Factory and Plantation. Uji is the second-biggest tea-growing region in Japan. Since the fourteenth century when tea seeds were brought over and planted, the area’s tea leaves have supplied the boom in Kyoto’s Tea Culture. You will have the opportunity to visit Uji’s tea fields and tea-processing factories, learning the history, culture, and taste behind the nation’s most popular drink. Experience a traditional Tea Ceremony, encompassing more than 400 years of history in a traditional, Japanese Tea Room. During our final cooking class we will explore the art of Izakaya cooking. We will learn to craft authentic and popular Japanese foods that are eaten in the homes of locals and local restaurants. Izakaya is the Japanese version of tapas, featuring a variety of small plates and dishes that are full of flavor! The cozy atmosphere of our cooking class is the perfect setting to create these local classics. As you complete your cooking class and set out to explore the city, take in the atmosphere an energy of this incredible travel destination. 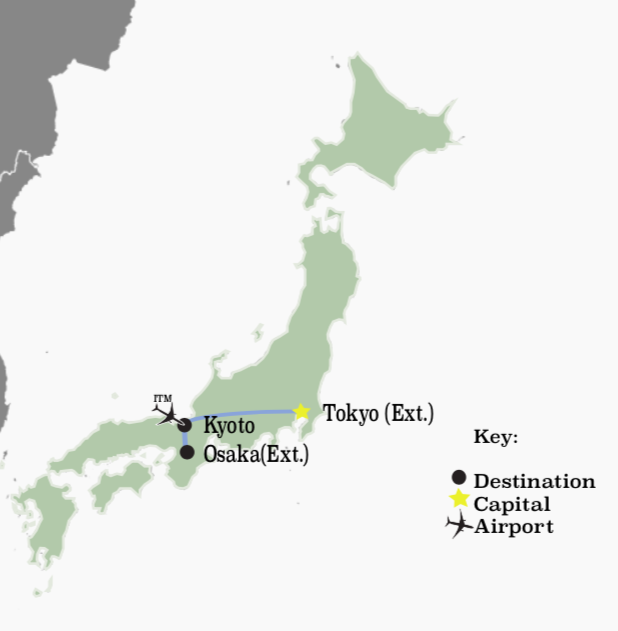 After a delicious breakfast and leisurely morning, we will say goodbye to Kyoto as we depart through the Japanese countryside to catch our international flights back home - or extend your stay another 3-days in Tokyo (see Tokyo extension directly below). After checking into your hotel in the heart of Tokyo, you will have the opportunity to explore the city before settling down at a traditional restaurant for a delicious shabu-shabu dinner. Shabu-shabu is a traditional Japanese experience in which you cook a variety of meats and vegetables in a simmering broth set over a burner on your table. Next, experience Tsukiji like never before - Tsukiji is home to the world’s largest fish market. More than 1,000 bustling food establishments line the streets of the market and its surroundings, filled with fresh tuna and hundreds of different types of fish. The freshest and finest foods from around the world can be found here. With your English-speaking professional chef, you will learn about all varieties of fish and natural produce, visit the auction floor, and even have the opportunity to sample different varieties of fish and sauces. In the afternoon you will proceed to your cooking class, where you will put the fish to good use, learning how to make a variety of sushi, nigiri and sashimi dishes. 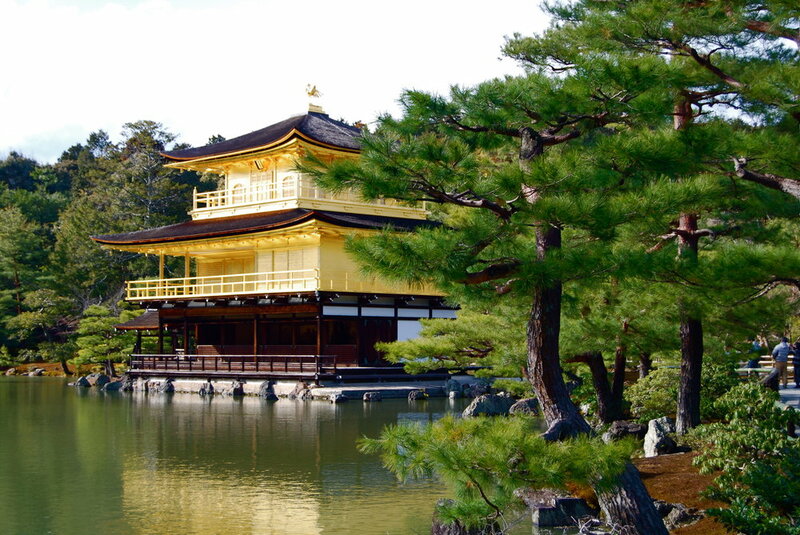 If you are interested in our 4 day extension to Osaka, please email a member of our team at expeditions@acanela.com.